Two Kahuna priests are fighting for control over a group of Islands. They try to rule over the majority of 12 Islands in the South Sea Atols. Both players can build bridges between 2 islands. The player who has the majority of the bridges on an Island, may place a Kahuna stone in his color on the island as sign of his power. The board game is played in three rounds. The player that has the most Kahuna stones after a round scores points. 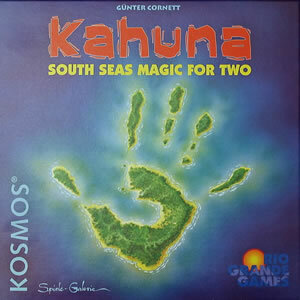 The player with the most points at the end of the board game, wins the board game and will rule over all the islands. Players take turns to play the game. The player on turn, plays any number or zero cards, then he takes a new card. 1. Play any number (0 to 5) of cards from his hand OR secretly discard cards. Build a Bridge: For each played card, build one bridge that connects to or from the island shown on the card. Remove an Opponent’s Bridge: Play 2 cards simultaneously. 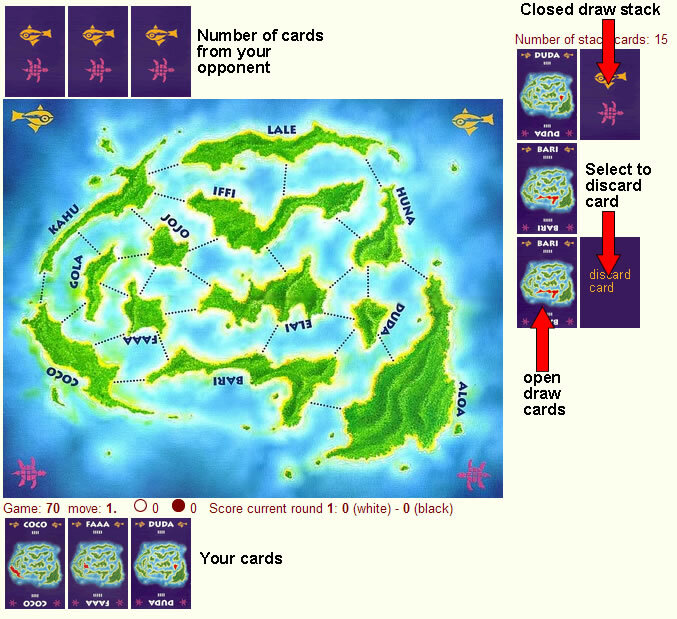 The 2 cards played must match the island(s) that the bridge to be removed connects (e.g., a HUNA-ELAI bridge may be removed with 2 HUNA cards, 2 ELAI cards or 1 card of each). Seize/Lose Control: If the building of a bridge results in the player having a majority of the possible bridges for a given island, he takes control -signified by placing one of his Kahuna stones on it- and any and all opponent’s bridges connecting to that island will be removed. If the removal of a bridge causes a player to not control the majority of possible bridges to an island, his Kahuna stone will be removed as well. Discard: Instead of playing cards, the player may discard any/all card(s) from his hand on of the discard pile. A player may choose to neither play nor discard any cards. 2. Draw one card from either the open draw cards or the blind draw pile OR draw none. 5 Card Hand Limit: A player may never have more than 5 cards in his hand. Forced Draw: If a player chooses not to draw a card, his opponent MUST draw one next turn. When a open draw card is taken, it is immediately replaced by a card from the blind draw pile. Round One: The player who controls more islands scores 1 point. Round Two: The player who controls more islands scores 2 points. Round Three: The player who controls more islands scores the difference of islands controlled. The winner is the player with the higher total score for all three rounds. If there is a tie, the player who scored in Round Three is the winner. If still tied, then the player with more bridges on the board wins. Instant Victory: If during Rounds Two or Three a play er is without a single bridge on the board, the other player is immediately declared the winner. A bridge may be built by either player regardless of whether either of the islands in question has a Kahuna stone on it. The removal of a bridge may cause a Kahuna stone to be removed, but the removal of a Kahuna stone does not itself cause a bridge to be removed. The number of cards in the game is 24, 2 cards of each island.